uncheck the boxes at Categories and/or Tags to disable the display option. Note: If you wondered why categories/tags are not displaying across all your sites even though you have enabled them at Canvas (refer below), you need to come back to the Post/Pages Output to check if the boxes are ticked. I learned this after using time to figure out why the Categories/Tags failed to display even though I have enabled them in the canvas. 2. To selectively enable/disable the Category and/or Tag at certain posts/pages/templates, then head on the Thesis> Skin Editor function. The default tab is the Home button. Click on the Home button to select other template like Single, Page, Archives and other custom pages that you may have created. Open the template that you wish to edit (at the Thesis> Skin Editor> Canvas). By default, you would find the Categories nested below the Header Area> Byline (click to expand it)> “Post/Page Post Box- Categories”. The Tag is located beneath the Content and labeled as “Post/Page Post Box- Tags”. To remove the Category and/or Tag from being displayed on the page, press “Shift” button on your keyboard, click on the Category or Tag box and use your mouse to drag and move it to the grey box on your right. Remember…move to the grey box. Never move to the pink box because it will permanently delete the Category and Tags across all your sites. After that, click on the green Save Template and view the changes in your site. If you have a caching function in your site, you may not see it immediately. You may try to access a different page (but belonging to the same template). Else access from your mobile device. Repeat the above with other templates in which you would like to change. By clicking on “show tray”, it will display the elements of the page. Click once on the element and it will be moved to the active content area. Then use your mouse to drag and place at the position that you want. For example, if you want your Categories to be displayed after the post instead of at the top, then just drag the “Post Box (Post/Page)- Categories” below the “Post Box (Post/Page)-Content”. If you want to move it at the top next to your name, then move it into the Byline box. Do the same with “Post Box (Post/Page)- Tags”. 1. Site caching plugin which may prevent the changes to be displayed immediately. 2. 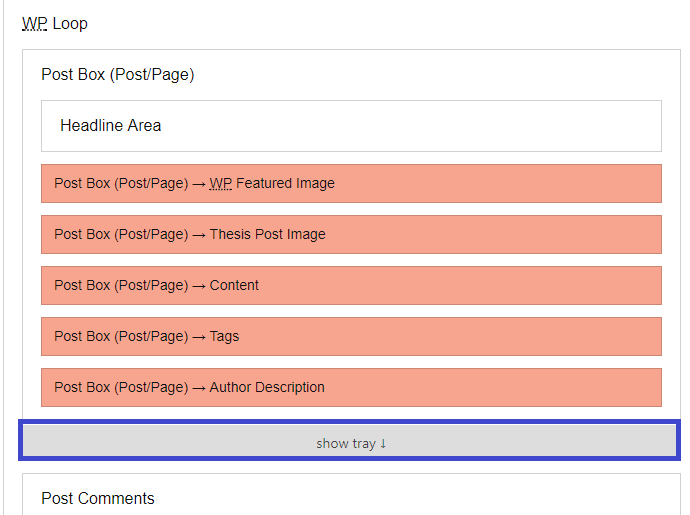 Go back and check the Dashboard> Thesis> Skin Content> Post/Pages Output…ensure the Categories and/or Tags box is ticked (if unticked it will not displayed across all the sites even though it is displayed on your Canvas). There were few times I have unchecked the boxes here and forgotten about it. Then when I decide to enable back, I was wondering why the changes I have done in Canvas were not reflected on the site.